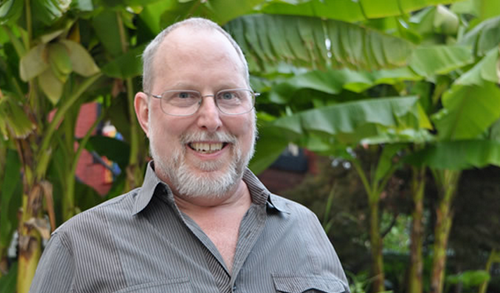 There are many LGBT activist who’s work goes unsung in the LGBT community and one person who should be remembered for his hard work to our cause is Leonard Hirch who passed away at the age 60 last night in Washington, D.C. after a battling cancer. Federal GLOBE’s chartered purpose is to eliminate prejudice and discrimination in the federal government based on sexual orientation by (1) developing and providing educational programs, materials and assistance mechanisms which address the distinctive concerns and problems of lesbians, gay men, and bisexuals in the federal government and (2) educating the general public, policy makers, and federal employees about issues of concern to lesbians, gay men, and bisexuals. Hirsch, originally a New York City native, spent time in California, Illinois and Florida before settling in Washington in 1985. Lenonard Hirsch’s husband of 33 years Dr. Kristian Fauchald, a marine biologist, suffered a heart attack and passed away only a few weeks ago. Thanks to Leonard Hirsch and GLOBE together they educated and helped countless numbers of LGBT Federal employees who faced harassment and discrimination in the Government workplace. 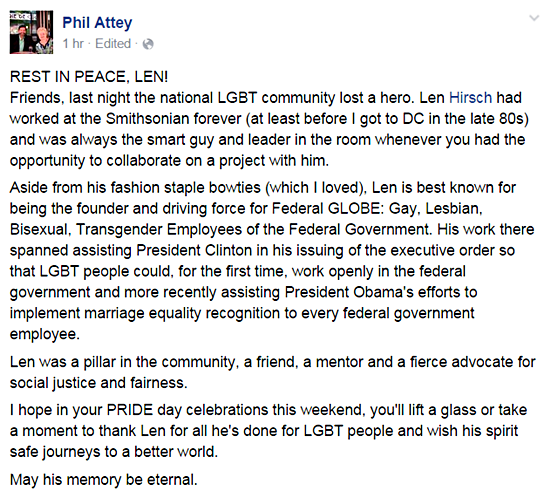 Len Hirsch was and is a true LGBT American hero.